She doesn’t really want to know. She just likes tea. The heat against her palms, the rising vapor’s flux. The objects: papered canister, pot, little cups. The ritual. Each swallow of reflected sky. not quite seen, never inevitably known. or clients won’t come, and she’ll drink her tea alone. watches it darken in the cup. The last bit’s strongest. She looks across it at the faces she’s loved longest. She’d rather not know; but she really does like tea. Hilary Biehl’s poems and short fiction have most recently appeared in Luna Station Quarterly, Expanded Horizons, Dappled Things, and Barking Sycamores. She lives in Santa Fe, New Mexico. After a cup of tea has been poured, without using a tea strainer, the tea is drunk or poured away. The cup should then be shaken well and any remaining liquid drained off in the saucer. 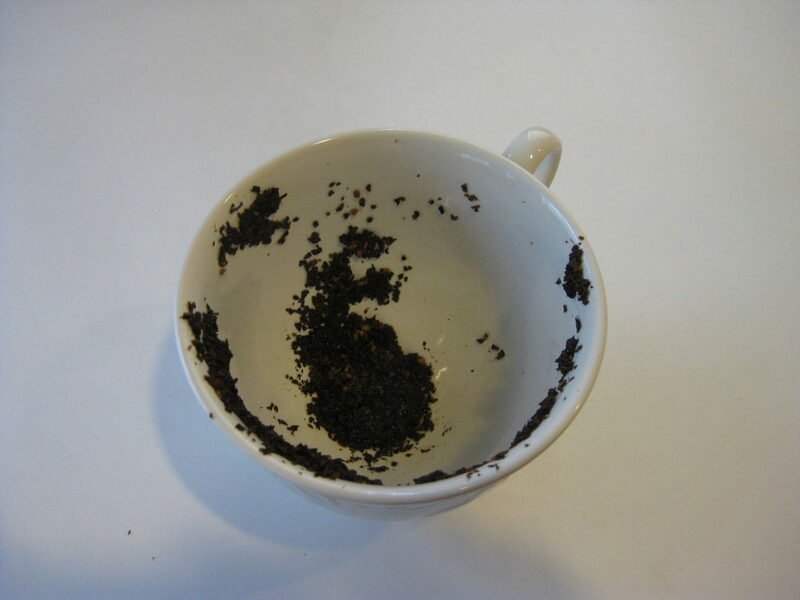 The diviner now looks at the pattern of tealeaves in the cup and allows the imagination to play around [with] the shapes suggested by them. They might look like a letter, a heart shape, or a ring. These shapes are then interpreted intuitively or by means of a fairly standard system of symbolism, such as: snake (enmity or falsehood), spade (good fortune through industry), mountain (journey of hindrance), or house (change, success).